Back to Frank Black speaks to Matthew R. Perry! 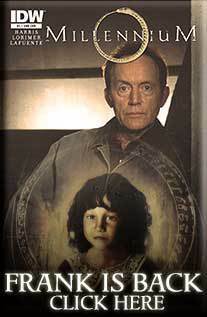 Millennium reaches twenty – and that’s a rather impressive thing. Not the age, no, because everything reaches twenty in some form or another. Alive, inanimate, dead, and fictional, all things make twenty. For most things, once finished, the point of twenty years is a meaningless landmark; an arbitrary cultural milestone that fetishizes even numbers. Indeed, the product of interest has often finished long before a twenty mark, particularly media products. In any case, we’re just finding a good excuse to remember something we love(d) – to celebrate via a magic number. With Millennium, we’ve had good reason to look back at the years it was an active, ongoing brilliant product, and we’ve had good reason to appreciate the years that followed where we have seen critical and fan celebrations, some of which created new products in their own right. For Millennium we’ve seen feature packed DVD box sets, special edition CDs honouring the ethereal soundtrack, and comics that have perpetuated the story of Millennium to other media forms. In fandom we’ve seen spin-off fan-films that have conjured up possible futures of the show, spin-off T-Shirts (I will never forget writer Glen Morgan proudly wearing his fan-shirt), and we’ve seen Millennium alumni work alongside Millennium fans creating trailers, judging competitions, and working towards charitable goals. For a show that lasted just three years, that’s not bad going. I could talk about what Millennium means to me, what it has meant to Back to Frank Black, and what Back to Frank Black has meant to Millennium. It has a fun sort of snake-eating-its-tale-vibe to it, but I think my colleague Brian A. Dixon does it best here at FourthHorseman Press. I won’t begrudge you clicking the link and reading what he has to say. As founder of the Millennial Abyss, a Millennium repository that pre-dates – and inspired – this site, I’d say his words have meaning on this topic. So what is there for me to say? Well, it’s weird that for a campaign to bring back Millennium dating back to 2008 (with roots harking back to 2007) has become a near decade-long celebration of the show. It has lasted nearly half as long as the show itself. I’d like to think, through the focal lens of fan fascination, much of the celebrations I have been describing are indebted to that fan culture in one way or another. That’s not to say that sites such as Back to Frank Black, or TIWWA should take credit for those events and successes of “fan power”, but I they become sites of activity for Millennium. No show can be considered by its production alone, or its creator, or its broadcaster. The audience – or consumer of the shows is an active and powerful force. They will make or break even the best show, and they can raise a show from the dead like any good necromancer. This doesn’t always mean they always get a show back on the air, but their love and passion can reanimate a show, even for a short time. A good show will indeed be born from strong creative forces, but that child will itself birth a potent fanbase. You could say the creator’s strong genes pass on down through the show to its consumer fan-base. The strong fanbase becomes the show’s antibodies and will seek to protect and to defend the show – to keep it alive. Yes, that’s a mixed biology analogy, but I think seeing any show’s legacy being an organic and structural inter-relationship between the creators, the product, and the consumers is important: Millennium becomes the body that enshrines it all. Back to Frank Black was one such set of antibodies, and as always I must say the book, Back to Frank Black: A Return to Chris Carter’s Millennium very much embodies that work. It is a testament and demonstration to the love of the fans and the power of that show (and proceeds go to charity, so do indulge in grabbing a copy). So I think Millennium is worthy of a twentieth celebration because it has continued in various forms throughout those two decades. Maybe not consistently, but definitively, it has never gone away. In light of the twentieth, I’ll be re-adding some old (and maybe some new) material to the website which I hope proves to be a respectable homage to the work of fans, cast, crew, and Millennium itself. The millennium may have passed, but Millennium has not. I think that’s rather cool. Publishers of Back To Frank Black: A Return to Chris Carter's Millennium. Great resource for Millennium episodes and information about the show. Upcoming fan documentary on Millennium. Writer John Muir does many great articles on Millennium and was also a contributor to our book. Frank Spotniz' production company's fan section that covers Millennium and The X-Files. Major resource for The X-Files news and coverage. Back to Frank Black was a campaign to bring Millennium's Frank Black back. After a campaign that resulted in an original book, t-shirts, collaborations between cast, crew and fans, plus a brand new canon comic book from IDW publishing, the campaign came to an end in 2016 after 8 years. Millennium fans continue to thrive, and the site is now an active repository for such Millennium lovers.